The capital of Campeche is named San Francisco de Campeche, but is commonly referred to simply as Campeche or Ciudad de Campeche (Campeche City). In Yucatec Maya, it is named Ahk’ìin Pech. Located on the shore of the Bay of Campeche, the city was an international trading port with major commercial, military and religious importance during the Colonial era. Old colonial city walls and fortifications are still present in modern-day Campeche, and the city was declared an UNESCO World Heritage Site in the late 1990s. Campeche is a vibrant example of a planned baroque colonial city with a reticular and regular street network. More than a thousand buildings with historic value built by previous generations here have survived into the 21st century. Despite this, it remains a fairly unknown tourist destination that so far have stayed out of the spotlight and never really attract the large crowds. The Bay of Campeche used to be an important and well defended harbor. The harbor was home to countless trading professions. The harbor served as a commercial hub in this part of the Caribbean. The harbor was visited by many traders from other important trade hubs such as Granada. At the last census, which took place in 2010, the capital had a population of 220,389 people. If we look at the whole municipality for which the city serves as municipal seat, the number was 259,005. The roots of the city go back to a Maya city named Can Pech, founded in the mid 1400s AD. Europeans arrived to city for the first time n 1517 on board a Spanish ship looking for drinkable water. At this point, approximately 36,000 people lived in the city, judging by Conquistador Bernal Diaz del Castillo’s description. The Spaniards invaded Can Pech in 1531, but lost everything except ten cavalry and 55 foot soldiers. When 20,000 Maya soldiers arrived to help the Can Pech residents, the Spaniards were immediately defeated. A new attempt was made in 1540 and this time the Spaniards succeeded, after having convinced the municipal leaders (the batab) to become allies of the Spanish crown. Afterwards, the Spaniards changed the name of the city to San Francisco de Campeche. Located on the coast of Yucatán, the city was a tempting target for pirates and buccaneers, prompting the Spaniards to start fortifying the city in 1686. 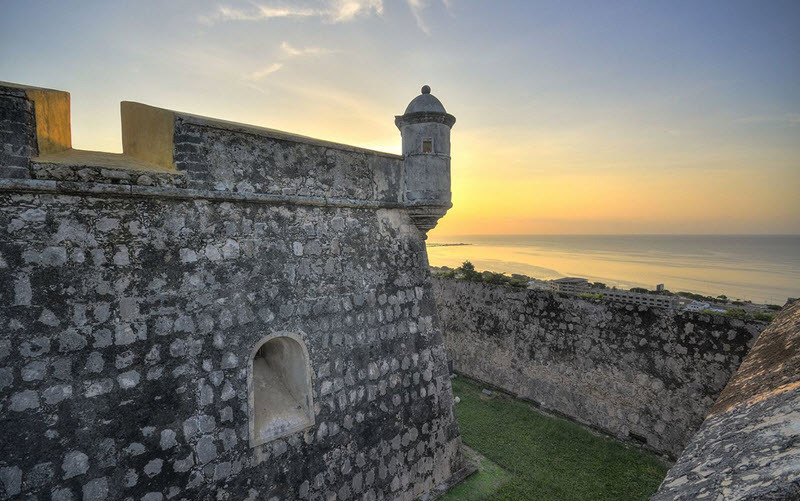 This fortification process continued through the 1700s as well, and became a part of the widespanning defensive system that the Spanish built to protect their Caribbean holdings from pirates. Campeche gradually became more and more fortified, and a French engineer named L. B. de Becour was eventually hired to unify the separate bastions by building city walls between them. When the city wall was completed, it was 2560 meters long and formed an irregular shape dictated by the defensive bastions that it connected. San Carlos This was the first fort built in the city, and it protects the Sea Gate. Today, it houses a museum. Nuestra Señora de la Soledad This one also protects the Sea Gate. It is a large bulwark and it contains a museum. San Juan This one protects the Land Gate. San Francisco Protects the Land Gate and houses a library for the federal Instituto Nacional de Antropología e Historia (National Institute of Anthropology and History). 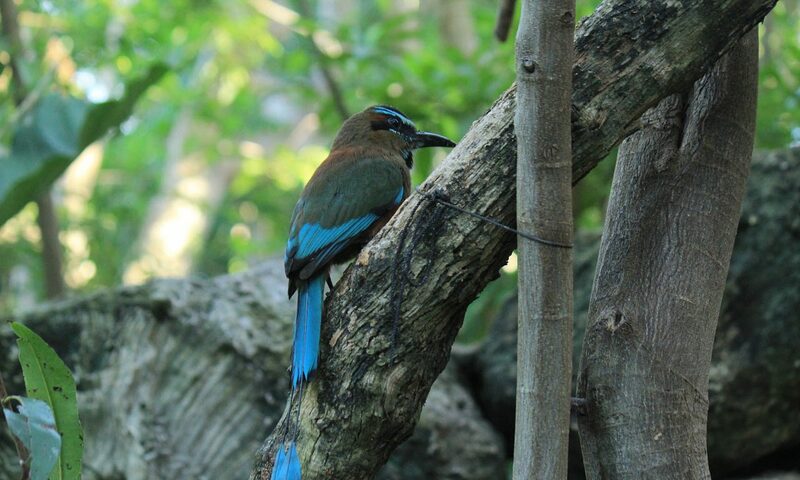 Santiago Has been reconstructed and is home to the Botanical Garden Xmuch ´haltún. San Pedro Used to be a prison. The two main entrances to the city, through the city wall, was the Land Gate (Puerta de la tierra) and the Sea Gate (Puerta del mar). There was also two smaller gates to the barrios Guadalupe and San Román, respectively. The Spanish colonists live within the city walls, while the indigenous population was relegated to life in the barrios San Francisco, Guadalupe and San Román outside the walls. The barrios still have their colonial-era churches left, including the one in Guadalupe which is now very old. The Land Gate, built in 1732, is today a popular tourist attraction, and some original equipment from the olden days are kept here. Sometimes light and sound shows take place that attract both locals and visitors. In addition to the city wall bastions, Campeche was also defended from two hill forts outside the city; the San José el Alto and the San Miguel. These forts served as look outs and could also attack seafaring marauders using long-range artillery. Both forts were built before the city wall was erected. Today, the San Miguel fort is a museum for pre-Columbian artefacts, while the San José el Alto is a museum for colonial-era boats and weapons.